Get a job at Starbucks, and you could bring home more than just a paycheck and some free coffee. The coffee company will now also pay for your college degree. Starbucks just announced a new plan to pay all tuition costs for employees who want to earn a four-year, online bachelor’s degree from Arizona State University. Previously, the company paid for students to take two years’ worth of these online classes, but the new Starbucks College Achievement Plan (CAP) will allow employees to earn full, four-year college degrees. And since one year of classes in ASU’s online program typically costs about $15,000, this is a huge benefit that could help you save a ton of money on student loans. Curious about how to get a college education on Starbucks’ dime? Here’s what you need to know about the program. Why is Starbucks Paying for College? The company acknowledges that financial barriers and the challenges of balancing work, school and life prevent many people from completing their college educations, and its leaders want to help employees overcome these obstacles. Starbucks is well-known for the comprehensive employee benefits package, including health insurance and 401(k) matching programs, that it provides to both full- and part-time employees, a practice that’s uncommon in the industry. “Education is one of the very best investments our partners can make, and investing in our partners is the best investment Starbucks can make,” explains the program FAQ. CAP is expected to cost Starbucks $250 million over the next decade, and the company hopes to help 25,000 employees earn their college degrees. Who is Eligible for CAP? Both full- and part-time Starbucks employees are eligible for this substantial perk. However, if you work at a “licensed” coffee shop, such as one in grocery store, you’re not eligible for the free tuition offer — you need to work at a regular company store. You must work toward your first bachelor’s degree; if you already have a four-year degree, Starbucks won’t pay for you to get another one. However, since 70% of employees don’t have college degrees, according to the company’s estimates, your odds are good. Starbucks estimates that more than 140,000 of their 191,000 employees are eligible to take advantage of the offer. Have you already started your degree at another institution? No problem. As long as you meet ASU’s transfer requirements, you can switch schools and take advantage of CAP. If you’ve already enrolled or earned credits at another school, contact ASU’s Undergraduate Transfer Office for advice on your specific situation. Which Degrees Can You Earn? Arizona State University offers dozens of different online degree options, including electrical engineering, information technology, nursing, psychology and Spanish. Through the program, you can earn a degree in any of these fields. ASU isn’t some fly-by-night institution or degree mill. It’s a reputable and well-known institution that U.S. News & World Report ranks fifth nationwide for “producing the best-qualified graduates.” Online courses are taught by the same professors who teach at the brick-and-mortar campus, so ASU online students receive a high-quality education. The school also offers six different start dates for students, so it should be easy to find a schedule that works for you. First, you’ll need to chat with a CAP enrollment counselor and apply to ASU. When you register for courses each semester, CAP will provide a scholarship for 42% of the costs of your college credits. ASU will guide you through applications for both federal and school need-based financial aid, which should help you pay the remaining 58% of your tuition. At the end of the semester when you’ve completed your course credits, Starbucks will reimburse you for whatever you paid for tuition. Here’s best part: If you win any merit-based college scholarships, they don’t reduce your reimbursement, according to the CAP FAQ. That means you could even get paid to go to college! There aren’t many caveats with this offer — it looks like a great deal. 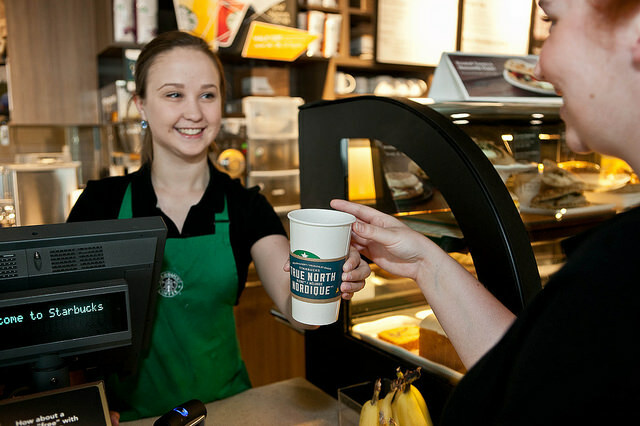 If you take advantage of CAP, you don’t have any obligation to the company; you don’t have to keep working for Starbucks after graduating. You do have to stay with the company until the end of a semester to receive your reimbursement for that semester. So you can’t work for a week and have Starbucks foot the bill for the next few months. Likewise, if you drop out of your classes partway through, Starbucks won’t pay for them. You have to complete the semester to receive your reimbursement. One other important note: Additional school-related expenses, including textbooks, laptops, lab fees and living expenses, are not included in the offer. To help pay for these often-substantial costs, you should contact the financial aid office to see if you qualify for any loans or other sources of financing. First, you’ll need to get a job at Starbucks. You’ll become eligible for tuition assistance along with other other benefits after you’ve worked 160 hours over the course of two months. Then, follow this chart showing the path to taking advantage of CAP. Connect with an ASU enrollment counselor through CAP to determine the best date to enroll in classes and take full advantage of the opportunity. You’ll need to collect any previous school transcripts, select courses, attend classes, and finally, graduate. Following graduation, you can either continue working with the company, or use your new degree to help you explore other opportunities. Your Turn: If you work for Starbucks, will you take advantage of CAP? If you don’t already work for the company, does this benefit tempt you to apply?